Here's a spontaneous doodle that I put together in about two hours tonight, as a distraction from other stuff I should be doing. I started it as a straight-to-Photoshop sketch on a toned background, using a layer of black lines and a layer of highlights/washes. Flattened after a while, then used some color overlays to bring the figure forward more, and a chalky halo to push her further out. I'm not sure if this is the final draft, but I thought I'd share. This came out of a quick warmup sketch that turned into a full-blown painting before I knew what was happening. About 6 hours over two nights. 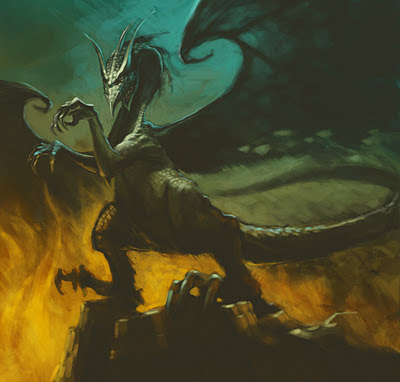 I wanted to create a classic dragon, ruthlessly evil, winged, and generally unpleasant. And with articulate hands. Dragons need hands. The sketch started very rough. I then tried to exaggerate the original stance I'd drawn by placing the legs further apart, suggesting weight. Some highlighting and deepening of shadows came next. I also refined the neck, making it a bit more sinuous, and elaborated on the back foot. The piece up until now had been created on a few layers: one for the darks, and another for the highlights, all against a textured paper background. I've been using a method whereby I draw on an Adjustment Layer mask, so the line art is revealing a color beneath. It's an easy way to adjust the color of the line art on the fly. At this point, I placed a weird orange to turquoise color gradient below the line art, again in an Adjustment Layer. This allowed me to tweak the gradient in real-time, and see the results as I adjusted. When I got some colors I liked, I started painting in opaque layers on top of the whole deal, eventually flattening everything and adding more layers on top as I refined areas like the head, wings, claws and flames. For most of the picture, I used a textured brush that I got from somewhere -- most likely an IFX disk. I was paying attention to focus in this one, hence the brushy areas juxtaposed against the detailed ones.And I tried to really nail down three distinct light sources: the ambient greenish sky lighting, the uplight from the flames, and an unlikely but effective spotlight directly above the dragon. A little while back I was contacted by the creator of a great little iPhone app called StampArtFever. The concept is essentially digital stamp collecting, allowing users to buy, swap for, bid on, and hunt down rare stamps to complete sets created by a single artist. Many of the stamps are lovely, using artwork either commissioned or leased by the game's creator, which makes the game a real treat. 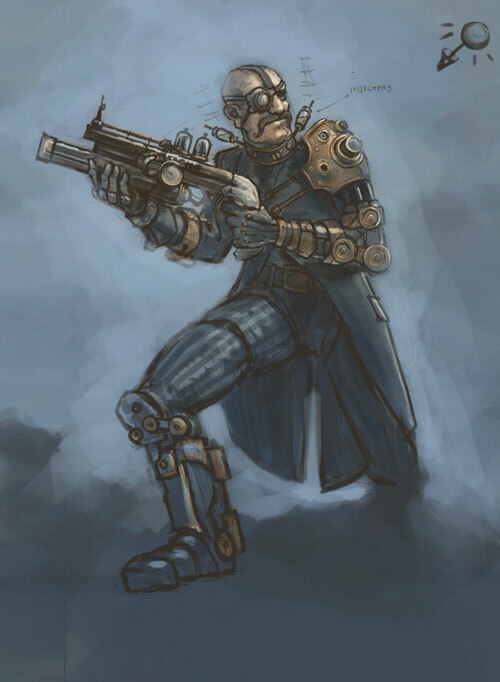 So I was pretty excited when he contacted me and tapped me to do a few pieces based in the steampunk world of The Robber Baron painting I did a while back. I already had a few characters floating around in my cranium, so it was with great pleasure that I took up my stylus and got cracking. Here's a preview of one of the characters, The Tinker. Nailing down a design for this dude was tough. The other three characters arrived pretty quickly, but this guy took a while. I knew I wanted someone who wasn't particularly heroic -- really just a professorial guy who makes cool gadgets for the government, and has since gone on the lam. I eventually got some solid line art down for the pose and face, with a few suggestions of the gun and shoulder piece. After that I did a lot of slow form-finding for the equipment by scribbling in and erasing out until things started to happen. From there I started building up washes of color and solidifying the forms. I'll try to post a few more updates as things progress, but in the meantime, check out StampArtFever. It's free for the iPhone/iPod, or a whopping 99 cents for the hi-def iPad version.